Rail engineers are earning double-time plus £775-a-day bonuses to work over Christmas and the New Year. 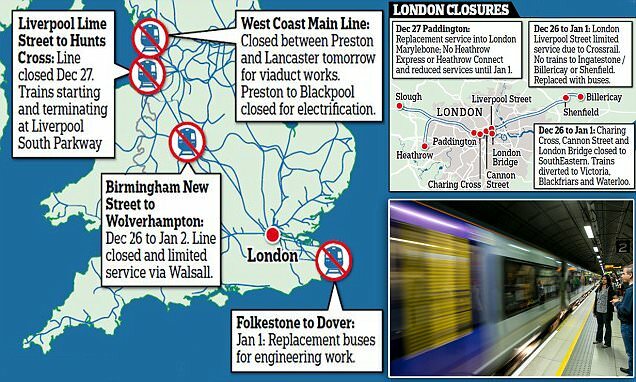 As millions face misery due to rail closures, the perks take some private contractors' daily salaries to the equivalent of twice what the Prime Minister is paid. Network Rail is spending £160 million on its 'biggest-ever investment programme' during the holiday season, and 32,600 in-house staff and subcontractors have been drafted in to work around the clock. Insiders say high wages have to be offered because of a scarcity of engineers in specialist roles. But critics last night highlighted how many vital public sector staff who have to work over Christmas get nothing like the generous sums available on the railways. Prison officers receive no extra pay, while most NHS staff receive just normal time plus 60 per cent. Police officers receive double time. Network Rail's in-house staff, normally earning between £25,000 and £60,000 a year, are being offered triple-time, or double-time and a lieu day for working Christmas Day, Boxing Day or New Year's Day. However, those arrangements are dwarfed by deals for some specialist workers. Balfour Beatty's track geometry service staff – who operate large machines which ensure track has been safely installed – can earn double time plus £775 a shift and another day off in lieu. Double time for these workers would be the equivalent of an annual salary of about £100,000. The bonus is the equivalent of £201,500 a year, making a total of more than £300,000. Theresa May earns £150,000 a year. Another contractor, Colas, is paying some specialist workers double time, a lieu day and £400 per shift, according to a document published on the RMT rail union's website.